On Monday, January 11, 2016, His Eminence Metropolitan Joseph hosted a visit by His Eminence Archbishop Demetrios, Primate of the Greek Orthodox Archdiocese of America, at the Antiochian Archdiocese Headquarters in Englewood, New Jersey. 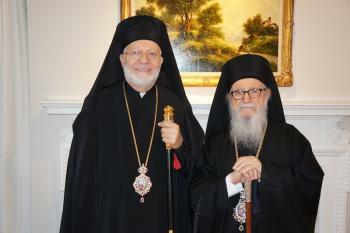 Also attending from the Greek Orthodox Archdiocese were His Grace Bishop Andonios of Phasiane, and Rev. Archdeacon Panteleimon Papadopoulos. Also attending from the Antiochian Archdiocese were His Grace Bishop John of the Diocese of Worcester and New England, Very Rev. Thomas Zain, Vicar General, and Very Rev. George Kevorkian, Hierarchical Assistant. The two hierarchs held a meeting in which they exchanged best wishes for the New Year, and for this Holy Season of Theophany, and they expressed their appreciation for the strong and brotherly relationship which they share. They also discussed some topics which are very important to the future of the Orthodox Christian witness in the United States and Canada. The meeting was followed by a luncheon and the exchange of gifts of appreciation.